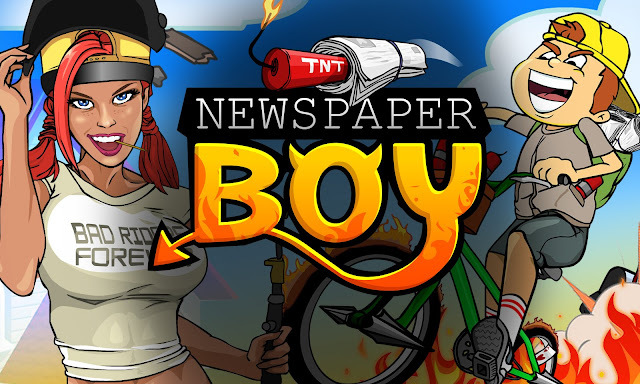 Newspaper Boy Saga - In you need to toss newspapers filled with dynamite into houses and windows to cause explosive fun. Highly influenced by the classic retro game Paperboy but this time a little more violent. You need to break all the windows to create combos, collect coins or avoid the obstacles. Several game styles to play and over 100 objectives to complete. You can then use your accumulated coins to upgrade your bike or obtain special items to use in the game. And for an extra challenge try to collect 3 stars in every level. The game features a huge map with additional options to collect even more coins! And lookout for further expansions of the map in future game updates. ► Toss or throw dynamite-filled newspapers. ► Break as many windows as you can. ► Create explosive combos by breaking all windows. ► Collect coins and avoid obstacles. ► Over 100 objectives to complete. ► View your progress in the neighborhood map.